Many years ago, while listening to a New Year’s podcast of Cast On with Brenda Dayne, she uttered the phrase “Begin as you mean to go on” and it has stuck with me to this day. I reflect on it every year as January 1st approaches, this idea of anchoring intentions with action, solidifying new beginnings by consciously working on them. Some choose to make resolutions or set goals, but for me the simplicity of that phrase means that I begin by doing. The first step is reflection, looking back at this year and forward to the one to come. And then I plan for a New Year’s Day that includes the things I want to nurture in my life. 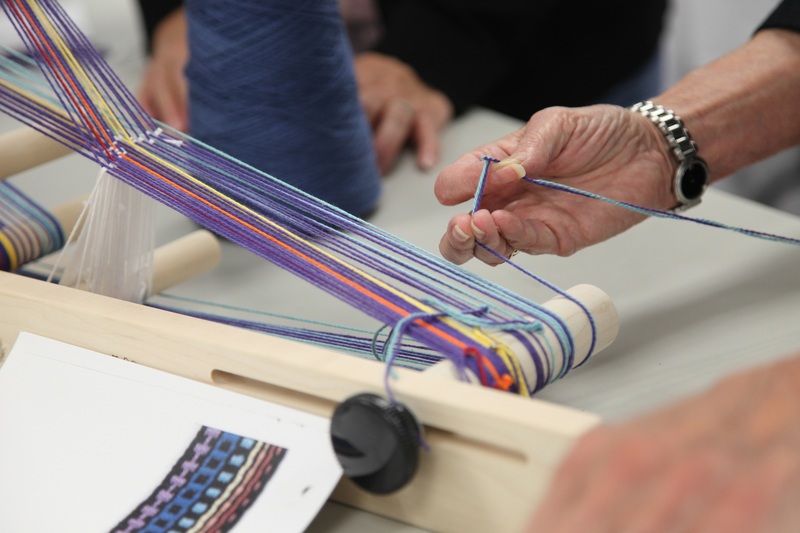 Weaving and spinning are both on the list, of course. It’s easy to get carried away with a 3-page list of ideas, but I’m narrowing it down so that I can enjoy some quality time with my creative side as well as my family. I want to make something for my sister so I dusted off my inkle loom and weaving cards and pulled out Candace Crockett’s great book , Card Weaving for inspiration. I forgot how quick and easy it is to set this up and get weaving! I’ve started a narrow band (1/4″) to use as a strap to hold her thread snips while weaving. It will be a fun project and small enough that I’ll be able to weave serious yardage that day. On the spinning side, I’ve just about finished spinning a bundle of Frabjous Fibers 3 Feet of Sheep and I’ve been pondering how I’m going to ply it. Lo and behold, I walk past the spinning area today and see the new issue of PLY magazine, with the theme of plying! I love this magazine for its in-depth articles and tutorials and I’m looking forward to curling up with it tonight and exploring ideas for what to do with my singles. 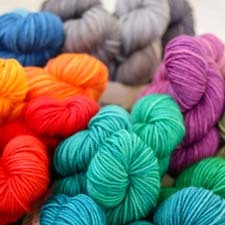 My project for January 1st will be to ply these gorgeous colors into a stunning yarn. So that is how I plan to begin the new year, doing the things I love and will continue to do throughout the year. What will you begin as you mean to go on? This entry was posted on Wednesday, December 21st, 2016 at 11:00 am	and is filed under Weaving. You can follow any responses to this entry through the RSS 2.0 feed. You can skip to the end and leave a response. Pinging is currently not allowed. That same episode of Cast On has inspired me as well. Brenda Dayne is such a treasure.